N 40° 30' 01" ;W 85° 30' 07"
N40° 26' 42" ;W85° 38' 43"
On the south side of CR400N about 0.2 mi west of CR900W is a large wooden sign for Baldwin Cemetery. From the sign walk south between the fields toward the wooded area about 0.2 mi. At the woods a path leads in about 100 yd to a small graveled area, then splits. The right path leads a few yards to part of the stones. The left path leads about 30 yd further to more. N40° 36' 26" ;W85° 51' 01"
N40° 28' 39" ;W85° 31' 23"
Updated Feb 2013 Located southeast of Gas City, on the north side of Wheeling Pike, about 1/10 mile west of CR400E. A lane along the west side of a long building (somewhat delapidated) leads about 500 yds to the cemetery. Branson Cemetery Located in south Marion, on the east side of Lincoln Blvd. ,just north of Home Avenue, adjacent to parking area for an abandoned fire station now used for a city bus barn. N40° 32' 36.6" ;W85° 38' 54.7"
* Buckwheat Burial Site Ø # According to ledgend this site is located along the side of the road between a private home and Walnut Creek near Wheeling Pike and CR650E. N40° 33' 11" ;W85° 34' 96"
N40° 25' 50.7" ;W85° 42' 02.9"
Conner Cemetery This single marker is located in north Marion, on private property on the southeast corner of Conner Drive and Michael Drive. N40° 36' 21.7" ,W85° 40' 43.5"
N40° 34' 37" ;W85° 50' 52"
N40° 37' 56" ;W85° 28' 24"
N40° 36' 51" ;W85° 40' 18"
Updated Feb 2013 Located east of the Marion Airport, behind some houses on the south side of Old Kokomo Road, at the southern end of Harmon Drive. It lies in two sections divided by a deep ravine. Please ask permission before crossing private property. N40° 29' 34" ;W85° 40' 12"
Updated Feb 2013 Located southeast of Van Buren, cemetery is about 300 yards south of CR300N about 1/4 mile east of CR1000E, in the middle of a farm field. N40° 35' 39" ;W85° 28' 52"
In 2011 the restored cemetery was rededicated. Read the Story. Updated Feb 2013 Located northeast of Converse, on a hilltop about 1000 feet east of CR900W, midway between CR300N and CR400N. N40° 36' 14" ;W85° 50' 36"
N40° 35' 47" ;W85° 41' 29"
N40° 32' 15" ;W85° 38' 23"
Located northeast of Marion, 200 yards south of CR450N, about .03 mile west of CR300E. An unimproved lane leads to the cemetery. N40° 37' 01" ;W85° 37' 11"
Updated January 2019 Located southeast of Van Buren, on the north side of CR200N, about 1/4 mile east of CR1000E. N40° 34' 55" ;W85° 28' 49"
N40° 35' 01" ;W85° 34' 48"
* Foster Cemetery Ø # Formerly located northeast of the intersection of East 23rd Street and the Railroad. N40° 28' 46" ;W85° 48' 04"
N40° 32' 24" ;W85° 40' 33"
(Futrell) Located northwest of Gas City, west of Garthwaite Rd. A gravel road at the top of the hill south of CR200S and south of Eastridge Drive goes west and ends near the cemetery. It is on private property. Please ask permission before crossing private property. N40° 31' 13" ;W85° 37' 10.5"
Updated May 2014 (Restorations) Located west of Matthews on the northeast corner of Wheeling Pike and CR1125 S.
N40° 23' 25" ;W85° 30' 33"
Updated Feb 2013 Located west of CR900E and north of CR200S. A gravel driveway leads south from the driveway of 8886 E. 200 S. Stop and ask for permission to enter private property. N40° 31' 20.7" ;W85° 30' 17.2"
(Lobdell, Watson) Located on private property, in a woods about 150 feet east of CR00EW, north of CR600N and north of Metocinah Creek. Access across private property restricted by cattle lot with electrified fence. Access from CR00EW is steep and wet. Cemetery badly overgrown with vegitation knee to shoulder high. Lots of poison ivy and thorns. Updated Feb 2013 Located north of CR600N, between CR250W and CR 300W. A small driveway leads from an historic marker on the north side of CR600N to a wooden fence & gate surrounding the old Indian school and the cemetery behind it. N40° 38' 28" ;W85° 43' 50"
Located west of Upland on the southwest corner of SR22 and CR800E. N40° 28' 42" ;W85° 31' 26"
* Johnson Cemetery Ø Location unknown. Updated March 2017 Located southeast of Point Isabel, on CR1000S about 1/2 mile west of CR700W. Old Knox Chapel cemetery is on the north side of the road. N40° 24' 26" ;W85° 48' 49"
Updated January 2019 Located southeast of Point Isabel, on CR1000S about 1/2 mile west of CR700W. New Knox Chapel cemetery is on the south side of the road..
N40° 24' 24" ;W85° 48' 52"
. N40° 38' 17" ;W85° 32' 51"
Updated Feb 2013 Located northeast of Upland, on the south side of CR300 S. about 100 yards west of the intersection with CR 1100 E.
N40° 30' 29" ;W85° 27' 55.5"
Little Ridge Cemetery Ø Located southwest of Fairmount, on CR1050S, about 1/4 mile east of CR200W. N40° 24' 01" ;W85° 42' 17"
Updated Feb 2013 Located east of Marion, on the north side of CR100S, about 1/4 mile west of CR600E. N40° 32' 20' ;W85° 33' 52"
Updated November 2018 Located north of Sweetser, on the northeast corner of CR250N and CR500W. 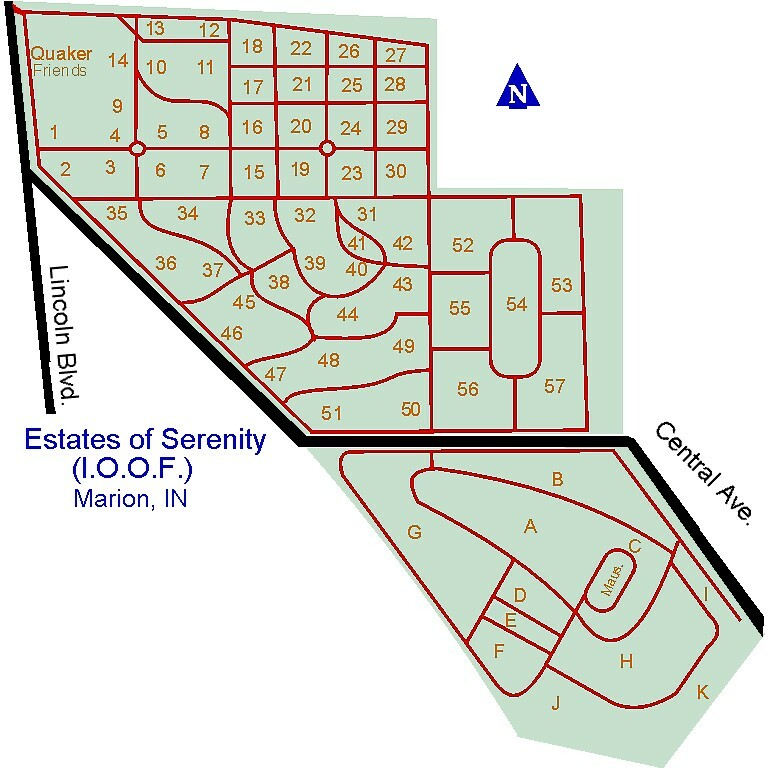 N40° 35' 23" ;W85° 46' 10"
Ø Located in east Marion, near the Veteran' s Home. The main entrance is on 38th Street, west of Lincoln Blvd, near the railroad. N40° 31' 12" ;W85° 37' 44"
Updated January 2019 Located on the northeast side of Matthews, near the Covered Bridge. From Massachusetts Ave. in Matthews, go east on 6th Street, which curves into 4th street. Cemetery is about 3/4 mile from Massachusetts Ave.
N40° 23' 20" ;W85° 29' 18"
(Fankboner) Located southeast of Gas City, south of Wheeling Pike, west of CR500E. A large historical sign on the south side of Wheeling Pike indicates the cemetery is 200 yards south of this spot. (This is not quite right.) Stop at home just east of this sign and ask for directions and permission to enter private property. N40° 26' 53" ;W85° 35' 03"
(Oak Chapel) Located northeast of Upland, on the west side of CR1175 (1115) W, between CR100S and 200S. It is across the road from the Oak Chapel United Methodist Church. (Note: this road is numbered 1175 at SR18 and 1115 at 200S. N40° 31' 52" ;W85° 27' 29"
N40° 34' 44" ;85° 49' 32"
The parking lot for the cemetery and monuments is on the west side of CR300W, south of CR600N. N40° 37' 47" ;W85° 44' 06"
N40° 25' 54.5" ;W85° 31' 10"
Updated July 2016 Located north of Marion on the southwest corner of SR9 and CR450N. Cemetery is between the church and the highway. N40° 37' 06" ;W85° 38' 32"
(County Farm, Potter' s Field) Located on the west side of Garthwaite Rd., north of Gas City about 3/4 mile north of Mississinewa High School and 1/2 mile south of Grant County Recycling Center. There are no markers. N40° 30' 18" ;W85° 36' 57"
N40° 31' 29.5" ;W85° 36' 05.2"
Normal Cemetery Located behind the church about 100 yards west of SR13 on the south side of CR600S. N40° 27' 52" ;W85° 49' 34"
N40° 35' 20" ;W85° 41' 22"
Updated Feb 2013 Located west of Fairmount, on the south side of CR800S, just west of CR100W. It is across the road from the Friends Church. N40° 26' 13" ;W85° 41' 34"
(Baptist Church Cemetery) Located southwest of Marion, about 1/4 mile south of SR 22 and 1/4 mile west of CR 300 W, in a small woods in the middle of a field. N40° 28' 35" ;W85° 44' 04"
Ø Located on the north edge of Fairmount, on the west side of CR150E., about 3/4 mile north of SR26 on Main Street, Fairmount. N40° 25' 53" ;W85° 38' 43"
Pence Cemetery Located on the east edge of Converse, south of SR18. A large sign on the south side of SR18 about 1/2 mile west of CR900W points to the cemetery which is about 1/4 mile south of the Highway on private property. Please ask permission before crossing private property. N40° 34' 28" ,W85° 51' 16"
Updated Feb 2013 Located on the north side of SR26, about 1/2 mile west of SR13. N40° 25' 18" ;W85° 50' 01"
* Potter' s Field Cemetery(County Infirmary) Ø Formerly located on the northwest corner of Western Avenue and 16th Street in Marion. It was at the northeast corner of what is now a parking lot. N40° 32' 48" ,W85° 40' 30" Approximate former location. No longer exists. Prickett Cemetery Located northwest of Marion on the north side of Frances Slocum Trail, about 1/10 mile east of CR200W. N40° 36' 33.5" ;W85° 42' 40"
Updated January 2019 Located east of Marion, on the north side of CR200S (38th Street), about 1/4 mile east of CR500E. N40° 31' 39" ;W85° 34' 24"
Rev.Reade Gravesite Located on the campus of Taylor University in Upland, north of the university entrance off SR22. Monument lies on the east side of the first northbound drive after entering from SR22. N40° 27' 28.5" ;W85° 39' 40"
Renbarger Cemetery Ø #Located northeast of Marion, on the east side of the Mississinewa River, about 1/2 mile west of a house at the end of Harreld Rd. It is on private property. Updated January 2019 Located on the western edge of Gas City, about 1 block south of SR22 on West Street or Broadway. N40° 29' 10" ;W85° 37' 21"
(Renner Family Cemetery) Ø # the exact location of the cemetery is unknown. It was south of Gas City in the area northwest of CR400E and CR600S. Updated Feb 2013 Located southwest of Sweetser, on the west side of CR600W, about 200 yards north of CR00NS. N40° 33' 13" ;W85° 47' 16"
Updated Feb 2013 Located on the east side of Marion, southwest of the junction of CR200N (Salem Pike)and King Rd.(CR200E). N40° 34' 53" ;W85° 38' 13"
Selby Cemetery Located on the west side of CR362E, north of SR26. Stop at the house at the end of the gravel road for permission to cross private property. The cemetery lies along the left side of a grass driveway about 400 yards further northeast. There is only one headstone. Please ask permision before entering private property. N40° 25' 51.3" ;W85° 35' 51"
Updated May 2014 (Restorations) Located southeast of Upland, on the west side of CR1000E, just north of the junction of CR800S. N40° 25' 15" ;W85° 29' 04"
Updated January 2019 Located north of Swayzee, on the east side of SR13, about a mile south of SR18. N40° 33' 31" ;W85° 49' 30"
Updated Feb 2013 Located south of Landess, on the east side of CR600E, 1/2 mile north of CR300N. Union Cemetery Ø #Located southeast of Fairmount, about 1/4 mile south of CR1100S where CR200E ends. It is on private property. There are no monuments. Updated Feb 2013 Located northeast of Marion, on the northeast corner of CR550N and CR500E. N40° 38' 03" ;W85° 34' 45"
Updated January 2019 Located south of Van Buren on the east side of SR5 (CR900E), south of CR400N. N40° 26' 32" ;W85° 30' 13"
Located on the north side of Gas City, on the south side of North " H" street, about one block east of Missisinewa High School. N40° 29' 42" ;W85° 36' 23"
Updated Feb 2013 Located southwest of Marion, on the north side of CR600S, between CR250W and CR300W (about 1.2 miles west of SR37). N40° 27' 58" ;W85° 43' 37"
* Weston/Lewis Cemetery Ø # The exact location of this cemetery is unknown. It was on a ridge on the eastern border of " The Prairie" northwest of Fowlerton, in the area south of SR26, between CR450E and CR525E. Whiteneck Cemetery Located northwest of the intersection of CR500N and CR500W, on the banks of Cart Creek. It is on private property. A grass road(?) runs between two rundown barns about 1/4 mile to the start of the cemetery. Cemetery consists of two sections (E-W) divided by a deep, but not steep valley. Of the 60 plus stones, only two are standing in their original location. The rest are down, broken, or both. N40° 37' 41" ,W85° 46' 30"
* Woodruff Cemetery Ø # The exact location of this cemetery is unknown. It was on the east bank of the Missisinewa River, south of Griffin Cemetery. where Grant County individuals are or may be interred. Photos added July 2012 Located about 3/4 mile inside Blackford County, 2/10 mile west of Blackford CR300W, about 3/4 mile north of SR18. A driveable grass driveway leads to the west to cemetery gate. N40° 33' 49" ;W85° 25' 56"
Updated August 2017 Located in far northern Delaware County, about 250 yards south of the Grant County line and 600 yards from Blackford County. It lies on the north side of Delaware CR1275N (via 1270N) about 3/10 mile east of Delaware CR370W. N40° 22' 36" ;W85° 27' 03"
Ø Located north of Marion on the east side of SR9 about ¾ mile north of the county line. 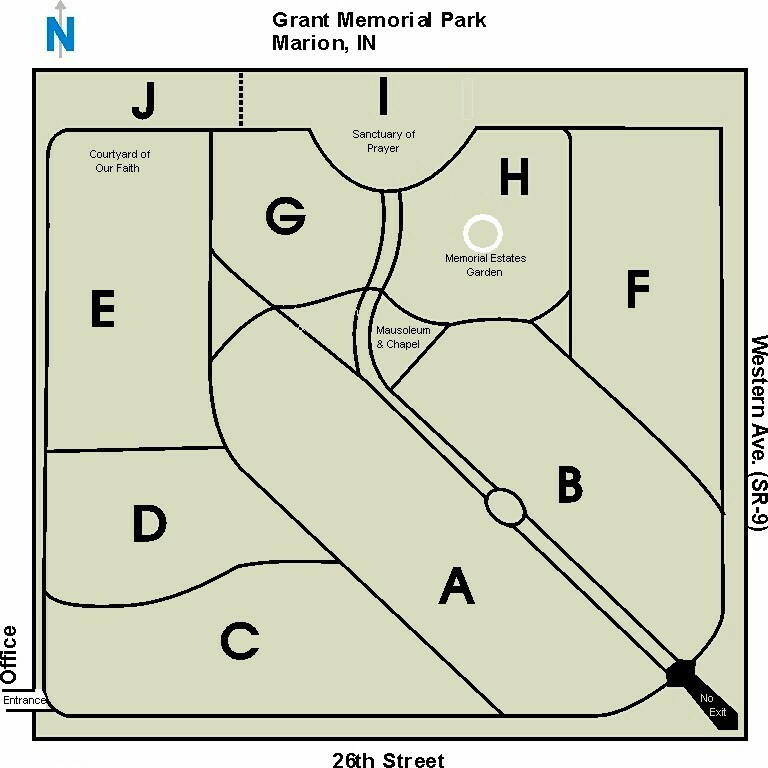 Actually located in Huntington County, but often refered to as Gardens of Memory, Marion. N40° 39' 52" ;W85° 36' 50"
Located in Blackford County northeast of Upland, about 75 yards east of County Line Road (1200 E.), between Grant CR400S & Blackford CR350 N. It is not visible from the road in summer when corn is up. N40° 29' 59" ;W85° 26' 44"
(Blackford Co.) Located about 1 mile inside Blackford County on northwest corner of Blackford CR200N (Grant CR500S) and Blackford CR300W. N40° 28' 46" ;W85° 25' 38"
Located east of Matthews,at the end of CR1050E. From the Covered Bridge in Matthews go north on CR990E to CR1100S, turn east to CR1100W, then south on 1100 to CR1175 S [at cemetery sign]. This road turns south after about 1/2 mile to become CR1050E, which borders the cemetery at its end. Actually in Delaware County. N40° 22' 43' ;W85° 28' 22"
Major restoration completed in Summer 2014 - Photos updated. Includes both old & restored photos. Located on the south side of Grant CR1200S about 1/10 mile east of SR37 in Rigdon. N40° 22' 43" ;W85° 46' 20"
Photos added June 2014 Located one mile into Delaware County, about 2 miles southeast of Matthews on the north side of Wheeling Pike. Heavily overgrown and very thick with mosquitos. N40° 21' 49" ;W85° 28' 09"
Note: Cemeteries with symbol have been photographed and are awaiting editing and name matching.